Getting behind on your tax obligations to the IRS is very stressful. Much of that stress stems from IRS collection notices. Not only is a delinquent taxpayer’s mailbox flooded with IRS mail, but that mail almost always contains scary, bolded “PAY NOW” demands, confusing language, and seemingly conflicting numbers. Clients often come to us overwhelmed, with either a box full of unopened mail from the IRS or a stack of letters on their desk that they stare at all day, every day and even see in their sleep at night. Neither technique—sticking one’s head in the sand nor living in constant paranoia—is helpful. However, meticulously parsing through the language of each and every IRS letter received may not be the best use of your time. Many of the notices are kicked out by a central computer at the IRS. Many of the notices are repetitive and redundant, containing no new important information. Some are, ultimately, inconsequential. My point isn’t that you can ignore these letters. My point in this article is that amidst a mountainous pile of IRS correspondence, there are a handful of notices that require your immediate attention. That list, and a brief description of the import of each, is below. If you have received one of these, it is in your best interest to take appropriate action. This is the initial demand letter. It notifies the taxpayer that there is a balance due and requests payment within twenty-one days (only ten days if the balance is over $100,000). If at all possible, this is the best time to address your tax issue. First, doing so will help stem the rapid accrual of various penalties for failing to file or failing to pay. Second, if the assessment is in error, the IRS at this point will likely be most receptive to your claim of why the assessment is incorrect. And third, failing to respond or pay by the due date on this letter creates a federal tax lien by operation of statute—this lien is called a “statutory lien” and gives the IRS a claim against all of the taxpayer’s current or future rights to property. The lien at this stage is not a public record, thus its other nickname as a “silent lien.” This is still a serious issue and the lien remains until the liability is satisfied, withdrawn or becomes unenforceable by the lapse of time. While this letter has a great chance to induce sticker shock from the sizeable penalties the IRS imposes, it is by far the least bad notice on this list. We may file a Notice of Federal Tax Lien against you. A tax lien generally attaches to all property you currently own and will attach to all property you acquire in the future. The Notice of Federal Tax Lien is a public record, and it can damage your credit or make it difficult for you to get credit (such as a loan or credit card). This letter is often followed up by notices CP502, CP503, and CP504. The threatening language escalates with each letter, with CP504 being the scariest. 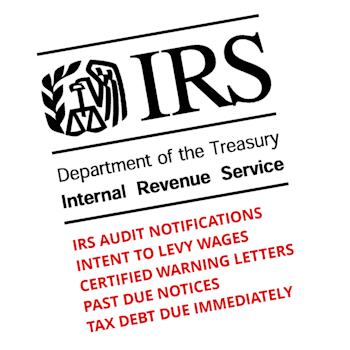 That letter, just above the bolded “Amount due immediately” is a warning, “Notice of intent to seize (levy) your property or rights to property.” In truth, this letter only allows the IRS to levy a state income tax refund or a federal contractor payment. Still, the 500 series notices are very serious, and indicate that you are getting close to a dangerous situation. If you have received one of these, it is time to contact a tax resolution services professional. This is the big one. With each new client we bring on, we try to ascertain immediately if they have received a “1058 Letter.” Sometimes this letter is designated as “CP90” or “Notice LT 11”—but the letter always contains similar language: “Final Notice of Intent to Levy” and “Notice of Your Rights to a Hearing.” This letter satisfies the IRS’s due process requirements under 28 U.S.C § 6330, enabling the IRS to seize a delinquent taxpayer’s property. As with other due process rights, this letter serves notice and provides the taxpayer the opportunity to be heard. Specifically, the opportunity to be heard is through what is called a Collection Due Process hearing. This is a hearing with an impartial officer in which the taxpayer has the right to propose a collection alternative to a levy, such as an Offer in Compromise or Installment Agreement. Another benefit of exercising this appeal right is that it typically takes a few months or more from the date of requesting the appeal until the actual hearing. During those few months, most taxpayers will not be under threat of any enforced collections. Even if the hearing is unsuccessful, it is worth noting that the protection from enforcement will generally continue for at least 45 days after the date of the hearing. If you have received this letter, it is often in your best interest to exercise your appeal rights. Do you own a business with employees? Do you operate through a legal entity—like an LLC or S Corp—that protects you from personal liability? Well if your business hasn’t kept up with its payroll taxes, the IRS can slice right through your corporate veil and hold you personally liable for the withholding or “trust” portion of payroll taxes. The IRS can even hold non-owner employees liable for the company’s trust taxes if the IRS can show the employee was “responsible and willful” for the non-payment of these trust taxes. Before the IRS can do that, each potentially responsible party must be “assessed” with these taxes, also known as a Trust Fund Recovery Penalty. The Letter 1153 informs the party that the IRS is proposing to assess the company’s trust fund taxes against them. The letter gives the party ten days to informally dispute the assessment with the company’s revenue officer or sixty days to formally protest the assessment with an appeals officer. The letter also provides that should the formal protest fail, there is a further remedy with the United States Court of Federal Claims or the United States District Court. If you have received this letter and do not feel that you should be held responsible for the company’s payroll taxes, consultation with a tax resolution professional is highly recommended. For more information on the Trust Fund Recovery Penalty, here is an excellent article on the topic. Above I wrote about the statutory or silent lien that attaches to a delinquent taxpayer’s property after notice and demand for payment. That lien is only good as between the taxpayer, the government, and potentially other creditors provided that the other creditors have actual knowledge of the silent lien. Letter 3172 notifies the taxpayer that the IRS has filed a Federal Tax Lien as a matter of public record. This lien attaches to all the real and personal property that the taxpayer has or will acquire in the future. This lien is harmful to one’s credit, can prevent a taxpayer from obtaining loans, and can prevent the taxpayer from transferring property with clear title. One important aspect of this notice is that it is not notifying the taxpayer that a lien will be filed, but that the lien has been filed. The appeal rights to this notice are limited to whether the lien was filed in error—either that the debt has already been paid off, the taxpayer filed bankruptcy before the lien was filed, or the lien attached to property not belonging to the taxpayer. Even with this lien, there are ways to get the lien subordinated to another lender if certain criteria is met, or have property discharged from the lien if the property is transferred and if the proceeds go to the IRS. Both of these options require strict compliance with IRS guidelines and are best handled by a tax resolution professional. Although uncommon and very difficult to obtain, it is possible in some cases to convince the IRS to withdraw the lien even if the underlying liability has not been paid. This notice informs the taxpayer that the IRS has levied, seized, or garnished property belonging to the taxpayer. These most often come in the form of bank levies, accounts receivable levies, or wage garnishments. These levies often hit cash-strapped taxpayers at the most inopportune times. Levies on individuals can be partially or fully released if the levy creates a “hardship” under IRS guidelines. Levies on a business account are often more difficult to get released, but there are a few arguments that can work. As with the issues implicated by the other notices, resolution of a hardship levy can be a complicated procedure best handled by a tax resolution professional. Have you received one of these notices? Do not stick your head in the sand and do not let it paralyze you. Like with most problems in life, these serious problems with the IRS are best handled head-on. If you’re unsure of the proper course of action, find a reputable tax resolution professional that can help you implement a step-by-step plan to address the issue before it gets worse and eventually put it all behind you.